For the past few months I have started routinely using extension tubes with my 100mm macro lens for photographing tiger beetles. I do this primarily because for most tiger beetles and other insects in the smallish to medium-sized range I need the capability to go both above and below 1X magnification, meaning that I must constantly switch between my Canon 100mm lens (1X maximum) and MP-E 65mm lens (1X minimum). With a full extension tube set (68mm), my 100mm macro lens effectively becomes a 0.7–2.0X macro lens, a nice range of magnifications for most of the photographs that I take. There is a secondary benefit to this in that the subject-to-lens distance is decreased somewhat, allowing me to get the MT-24EX flash heads closer to the subject for better lighting. Lately I’ve been wondering what the magnification capabilities would be if I added extension tubes to the 65mm lens. With a maximum magnification of 5X, it hardly seems that even more magnification would ever be needed, but who knows what uses one might find if the capability exists. In theory, it seemed like it should work—after all extension tubes are simply tubes with no glass (in fact, the 65mm lens itself is simply a macro lens with a very expensive, built-in bellows). The only consideration was whether the focal plane would remain outside of the lens. Tonight I finally decided to sit down and try it out, and the results were really quite stunning. 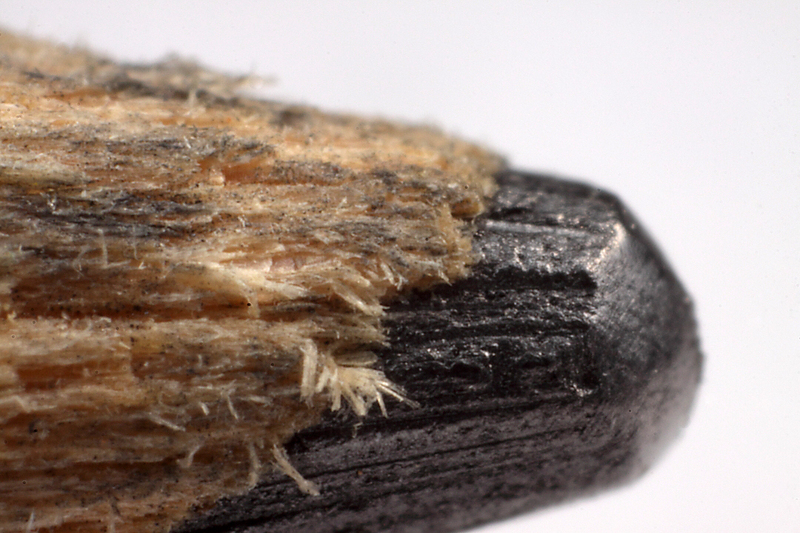 The three photos below show an ordinary pencil lead, the first with the 65mm lens alone set at 1X, the second with the lens set at 1X plus full extension tubes, and the third with full extension tubes and the lens set at 5X. The full extension tube set provides an additional ~1.7X magnification, making the 65mm lens effectively a 1.7–8.0X macro lens! The subject-to-lens distance is indeed quite short—only about 38mm or so. However, having at my disposal an 8X macro lens suddenly opens up a whole new world of ideas for insect macrophotography. Knowing that the combination of 65mm lens and extension tubes is possible, I just had to try this out on a living subject—like now! I happened to have in a terrarium a subject from the day’s collecting, so I tried it out—again with the 65mm lens fully extended to result in 8X magnification. Shown below is a example of this lens combination at full magnification, completely uncropped—can you name the subject? 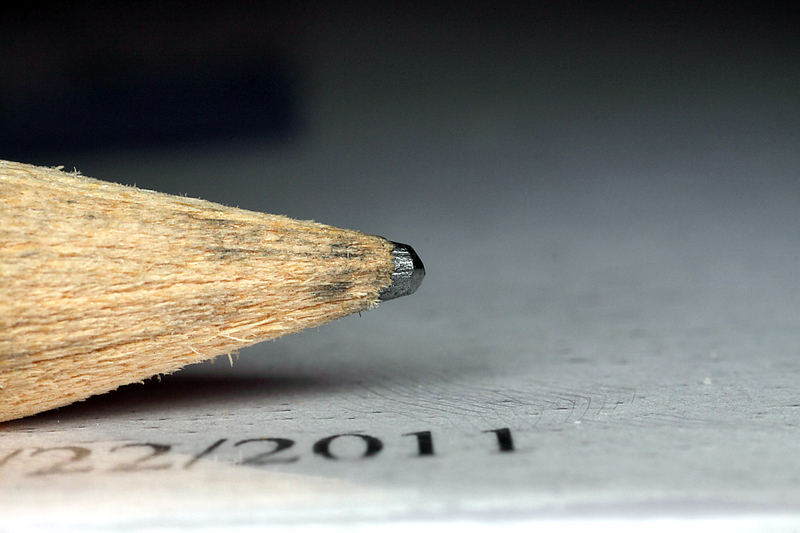 This entry was posted in [No taxon] and tagged photography, quiz, techniques. Bookmark the permalink. I know one thing—it’s hecka hard to find the subject in the viewfinder! Interesting. With the extension tubes on MP-E 65mm for 8X magnification, curious as to the working distance between lens and subject. About 38 mm – see last paragraph. Doh! …thanks for pointing that out Ted. For that magnification, that’s not too shabby. Yes, not that much closer compared to working at 5X. I was just glad the focal point was in front of the lens. Well, it looks like a tiger beetle eye. I don’t think I’ve ever seen one with sufficient magnification to clearly see the ocelli before, though! 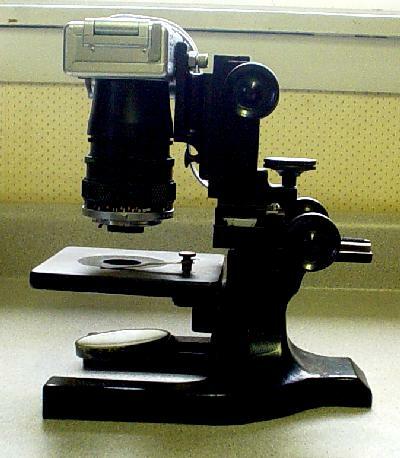 You definitely have a microscope strapped to your camera now. Maybe it’s time to try and lay hands on a microscope frame for it too? You’re right, it’s a tiger beetle eye. Btw, the compound eye is composed of facets rather than ocellii (the latter are simple eyes separate from the compound eye in some insects). He’s a machine. You can’t stop him! Like to know the camera settings, especially the flash? Was it full blown with the diffusers attached, what was the approx distance to the subject. Need help setting up your next super macro shot? All photos were shot at ISO 400, 1/250 sec, f/14, and full flash (ETTL, FEC -1 1/3) w/ Sto-Fen + Gary Fong Puffer diffusers. As mentioned in the last paragraph the approximate working distance was ~38 mm. Hmm… just canceled my collecting trip with my field biology class due to weather conditions. Batteries are charged and camera is ready to go, and I have a set of extension tubes sitting here next to me. I think my day is now shaping up! 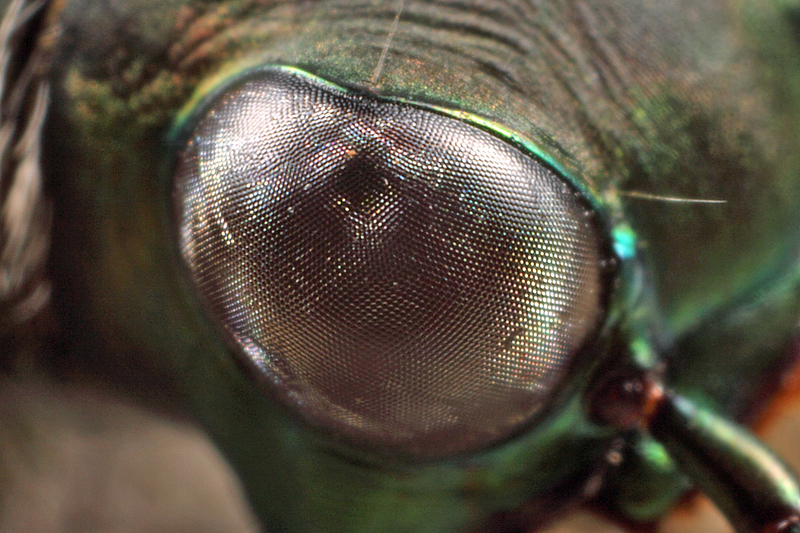 Amazing closeups, I would say Tiger Beetle eye. This will be my test to see if I have learned anything from reading your posts. I have my fingers crossed. Yes, tiger beetle eye. You’ve been a good student! 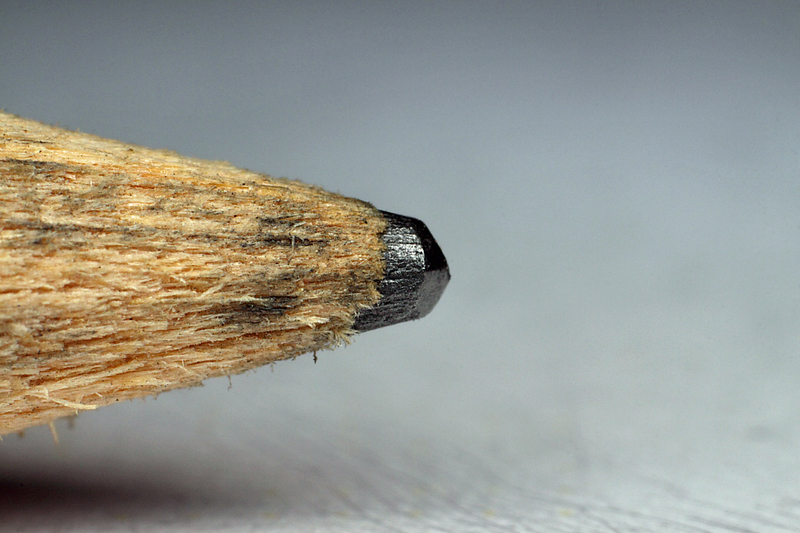 You’re right—it’s not perfect, and yes it is a tiger beetle eye. Really nice Ted! I agree with some of the others, you now have a microscope at your command! Keep up your great work and experimentation! Thanks Rob. I don’t know how much I’ll be trying this in the field, but it might be fun for some studio shots. Hand-held, or on a tripod, for these clear images? Not sure if I have the steadiness of hand to pull off this sort of work. It’s all in the bracing (and I drink lots of coffee :)). Nice, Ted. 8x is pretty extreme- did you find lighting at such a close working distance to be a challenge? Lighting was bit of a problem with my front-of-lens mounted twin flashes – I mounted each of them on a Kaiser shoe so I could angle them all the way down in front of the lens. It still wasn’t perfect but was easily adjusted in PhotoShop. I have a bracket idea that I’ve been thinking of for awhile that would take care of this problem also. Nice parasitoid photo! More mag would have been nice, but as is it emphasizes the wasp’s minuteness. A great demonstration of the capability of this combination. I am already having trouble finding my subject at 5x mag., never mind 8x. This technique is definitely not for moving subjects! You’re right, though – I’ll probably do this only in the studio under controlled conditions. Very interesting use of the mpe, i noted you exposed with flash at 1/250, what camera body are you using ? I can only go to 1/200 with the 5d mkii or the 550d. As a hand held shot this is pretty impressive as the view must be very dim through the eyepiece or do you use live view? Hi John – thanks for your comments. I used a Canon 50D body and helped illuminate the view through the viewfinder by using the flash head lamps on my MT-24EX twin flash. Since this is a full flash exposure, the effective shutter speed is actually much shorter than 1/250 sec (illumination comes strictly from the flash pulse), so that helps increase the sharpness. Hi Edward – cool collembolan photos! I would have never thought to try two sets of extension tubes. Hello 🙂 what type of extension tube are you using?? Those are Kenko extension tubes. Cheaper than Canon but fully compatible with electronic connections.